A message board from the Drillfield Memorial. 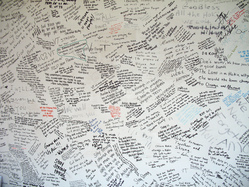 One of the message boards from the Drillfield memorial on 4/20/07. 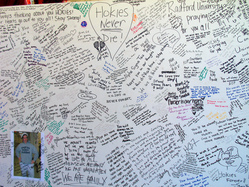 A message board from Hokie Hope Day on 4/21/07. 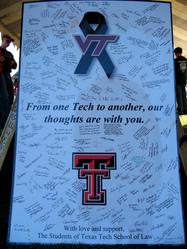 This message board from Texas Tech School of Law was displayed on Hokie Hope Day, 4/21/07. A message board from Auburn University. (April 18, 2007) Memorial on edge of drillfield; Torgersen Hall behind. Photo courtesy of Brent Jesiek. (April 18, 2007) Detail of VT memorial with striking juxtaposition. Note George W. Bush signature toward top center and expression of sympathy from Iranian nation directly to the right. (April 18, 2007) One of many inscriptions that have appeared on a series of memorial boards on the drillfield. Today I counted at least 32 of these 4 by 8 foot sheets, and they keep adding more as they get filled in. 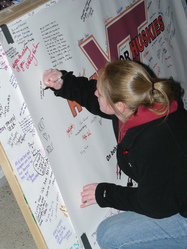 Attendee signs a message board at Virginia Tech&#39;s vigil for NIU. 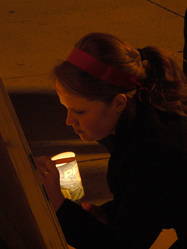 An attendee looks at a message board on Alumni Mall during the Virginia Tech vigil for NIU. Photo taken February 18, 2008. 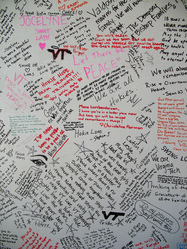 Messages of support written at Virginia Tech&#39;s candlelight vigil for NIU. Messages of support written during the candlelight vigil at Virginia Tech for NIU. 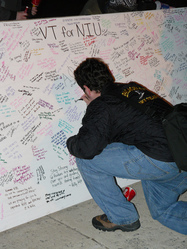 An attendee signs a message board for NIU at Virginia Tech vigil. 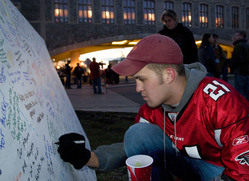 An attendee at a Virginia Tech candlelight vigil for NIU signs a message board on alumni mall. Photo taken Monday, February 18, 2008. Licensed under Creative Commons Attribution-NonCommercial-ShareAlike 3.0. 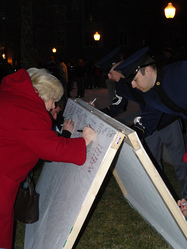 Attendees at a Virginia Tech candlelight vigil for NIU, including two members of the Corps of Cadets, sign a message board on alumni mall. Photo taken Monday, February 18, 2008. 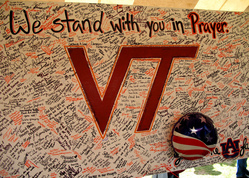 Prior to Virginia Tech&#39;s candelight vigil for NIU, an attendee signs a message board on display along alumni mall. Photo taken Monday, February 18, 2008. Students mill around a message board on display along alumni mall prior to the start of Virginia Tech&#39;s candlelight vigil for NIU. Photo taken Monday, February 18, 2008. 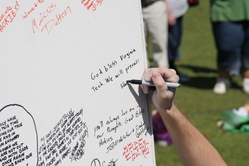 An unidentified individual adds a message to one of the message boards on the drillfield. Photo taken April 21.